Former deputy chief minister and revered statesman Daniel Tajem is leading SNAP’s charge to unseat Barisan Nasional in Sarawak. KUCHING: Sarawak Nasional Party (SNAP), which gave the Dayak community their first chief minister in Stephen Kalong Ningkan way back in 1963, is bent on redeeming its political relevance in the coming state election. Working against a wave of scepticism, a SNAP official said theirs was an “unwavering” commitment to giving Dayak’s back their political importance and self-esteem. SNAP is aiming to contest in 28 Dayak majority seats in the 10th state election. Leading the SNAP charge is iconic former deputy chief minister Daniel Tajem. Tajem, 72, is targetting the over 100,000 disillusioned PBDS members who are currently partyless. Tajem was once Chief Minister Taib Mahmud’s deputy, when the latter engineered the destruction of SNAP and PBDS and began his divide-and-rule policy of the state’s 60% native community. Since then the Dayaks have either been in political “wilderness” or aligned with Barisan Nasional allies Parti Rakyat Sarawak, Pesaka Bumiputera Bersatu, Sarawak Progressive Democratic Party and Sarawak United Peoples party (SUPP). The communities have also been economically marginalised and sidelined from Taib’s “Politics of Development” which he launched in the early 1990s and which saw him amend the Land Code to allegedly enable transfer, lease and convert native-owned lands in the name of growth. Despite Sarawak’s minerals and natural sources, Taib’s “Politics of Development” policies never filtered down to the longhouses that litter this landlocked state. Today under Taib’s 30-year administration Sarawak is the third poorest state in Malaysia. On the ground, SNAP is flagging Taib’s corrupt land policies which have eroded native rights. The party has begun its assault by flushing longhouses and Dayak majority areas in specific constituencies with 100,000 flyers showcasing the SNAP logo and Tajem’s call for Dayak’s to join SNAP’s struggle. Some 40 billboards and banners promoting the SNAP brand is also expected to go up later this month. Also being distributed are flyers promoting DAP secretary-general Lim Guan Eng’s pledge of a RM1 billion Dayak endowment fund if BN is unseated. According to youth chief Darrel Entrie, the past two weeks have been spent distributing flyers and some 50,000 VCDs on SNAP history to folk in longhouses in the rural areas. “We’re working with Dayaks in Klang Valley, Johor and Singapore. They are helping us with the flyers and VCDs. The flyers and VCDs are urging Dayaks to unite under 1SNAP to remove BN in Sarawak. “They feel SNAP is the best vehicle for the Dayaks as the party understands the local people’s plight,” he said adding that there was an urgent need to reacquaint young Sarawakians with their political heritage. He said SNAP was now reaching out to the youth through social network Facebook. “We are starting to work with the youths here in Sarawak. It is a little difficult because most of them don’t know the party’s history. They also don’t seem to know the state’s political history. “So our immediate job is to reacquaint them with the SNAP logo and its political heritage,” he told FMT recently. Dayak politicians will always be “La kia’, the unknown specie of the Dayak race. Now they are thinking of jumping out of PKR into SNAP. Nothing will prevent them from jumping out of SNAP into MDC once the ROS approved its registration. 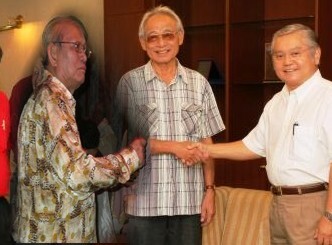 Sarawakians must punish such pariah politicians severely. I believe many many Dayaks working away from Sarawak have called their families at home telling them WHO to vote this coming polls though many of themselves might not be in the ability to return home…..
What is going on here?Sarawak should be No.1 richest state in Malaysia.Well..It’s all about corruption!Kick Taib and BNs OUT,Sarawakian! Very funny Sarawak is only ranked number 4 in the country based on approved Investments (but may not happen..something like MOUs) only and not on actual investments. That’s how MIDA can be paid by Pek Moh to raise the bar a notch higher. I wish you guys also be more proactive anytime, anywhere. Do not show yourselves only when the poll is around the corner. Prove your commitment towards the Dayaks. Also, these are districts you need to win big as well: Serian, Padawan, Bau & Lundu. These area are heavy populated by the Dayaks. Seriously…NOW…!!! Talk the talk, walk the walk…!! !